I hadn't discovered Bryan Reardon until this year when a colleague recommended his novel Finding Jake to me. I devoured that one, along with the advanced reader copy of The Real Michael Swann. I was mesmerized by both novels, particularly his latest, a book where true love between a husband and wife really shines through. One summer day, Julia Swann is talking to her husband Michael, who is at Penn Station waiting for a train home to Pennsylvania. She hears the phone go dead, and soon the tragic news comes from New York City: a bomb has gone off at the station, killing and wounding thousands. Julia begins a frantic search for her husband and is soon rocked by the news that, due to what is on a surveillance video, Michael is the #1 suspect in the bombing. She sets off on a quest not only to reunite with Michael, but also to prove that the government is dead wrong in their suspicion. Alternating narrators and time periods add much depth to this well-written mystery. As readers, we come to care deeply for the characters and want to see Julia succeed just as much as she does. 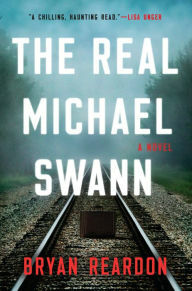 Reardon has crafted a terrific novel in The Real Michael Swann, one that will keep you up far past your bedtime reading away.